That post title should have piqued your curiosity! :-D It's Friday and we have another new challenge starting at QKR Stampede. As always, our theme is "Anything Goes" but we have an optional twist each time which you can use if you choose. This week the optional twist is "Wheels." I know, I know, my mind jumped right to cars, trains, wagons, etc., too, but this little guy caught my eye and I just had to use him! 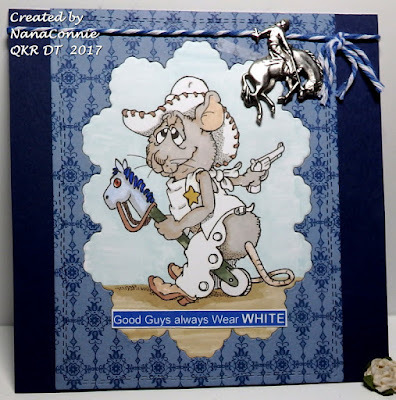 This is a QKR image called "Little Cowboy." I just love that his stick pony has a wheel on it (just in case you missed it.) 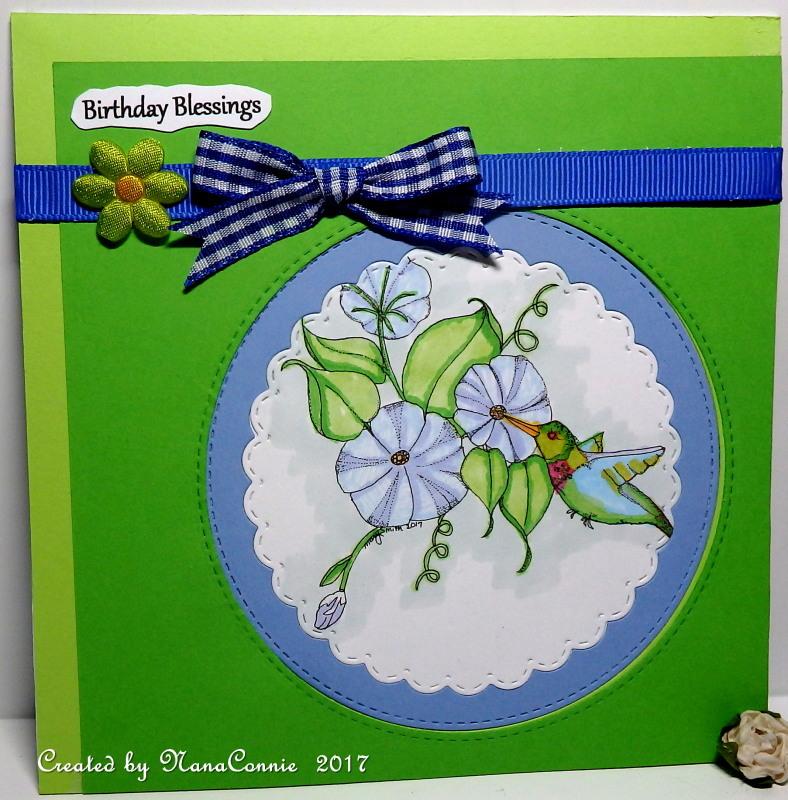 I was thinking about my friend, Lynn, from Texas when I was putting this card together and, since her favorite color is blue, that became the focus of this color combo. 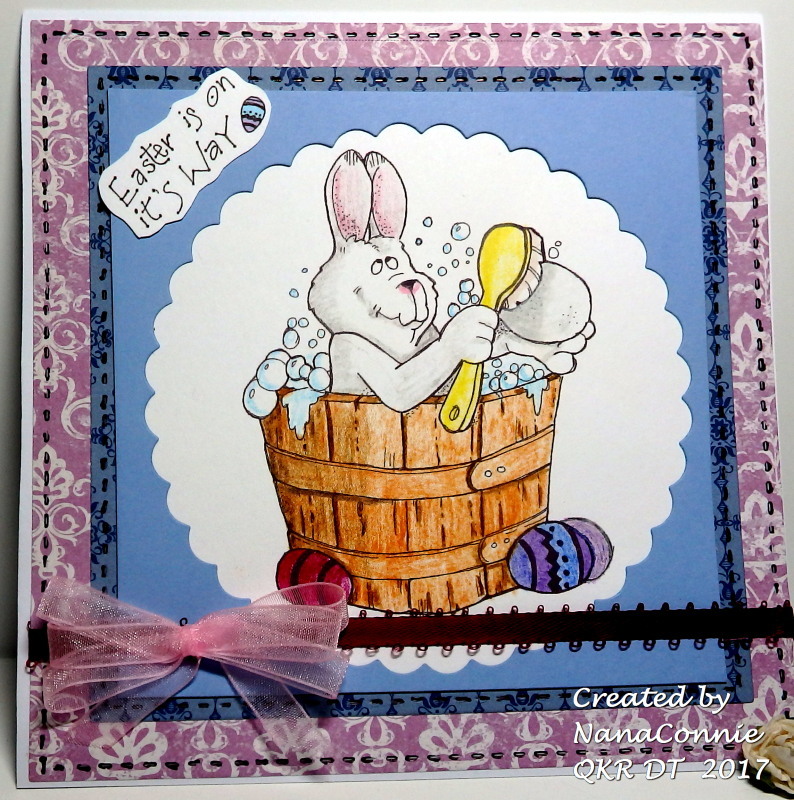 I colored with my ProMarkers, then die cut the image with a Sue Wilson die. 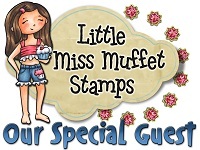 I used the same die to cut the dp (from Stampin' Up) and inlaid the image into it. I did the sentiment in white on a blue background just to emphasize why our little sheriff is wearing all white. :-D Everything went onto a black card front. Finally, I added the twine and the cowboy charm and called it finished. I think it's going to make a great masculine birthday card for some young boy. 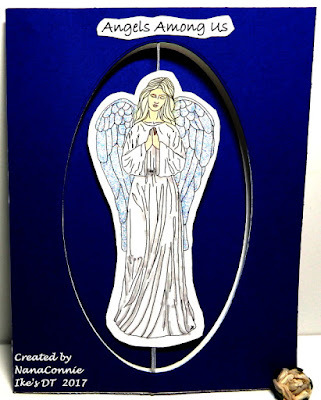 This is my first ever swing card and it was inspired by using the "Angel 4 Front and Back" from Ike'sWorld for the latest challenge starting today. As always, our theme is "Anything Goes" but we always have an optional twist if you want to use it. This week you have an option of "Angels or Demons." I chose Angels and did one more card for my stash. I colored with my ProMarkers and added loose glitter to the wings. I didn't get a photo of the back of the angel but I did the same thing on both sides. I adhered the images to each other adding the string between them before gluing. Then, I cut the images by hand so that the shape would be the same on both sides. I took midnight sky CS, added it to my card front with removable tape, then cut the oval with a die from Spellbinders, going through both layers. 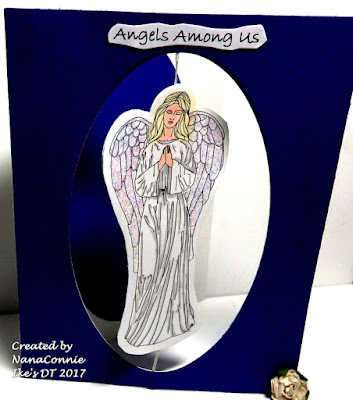 I took them apart, then used double stick tape to add the angel in the open oval, and permanently adhere the two layers together again. 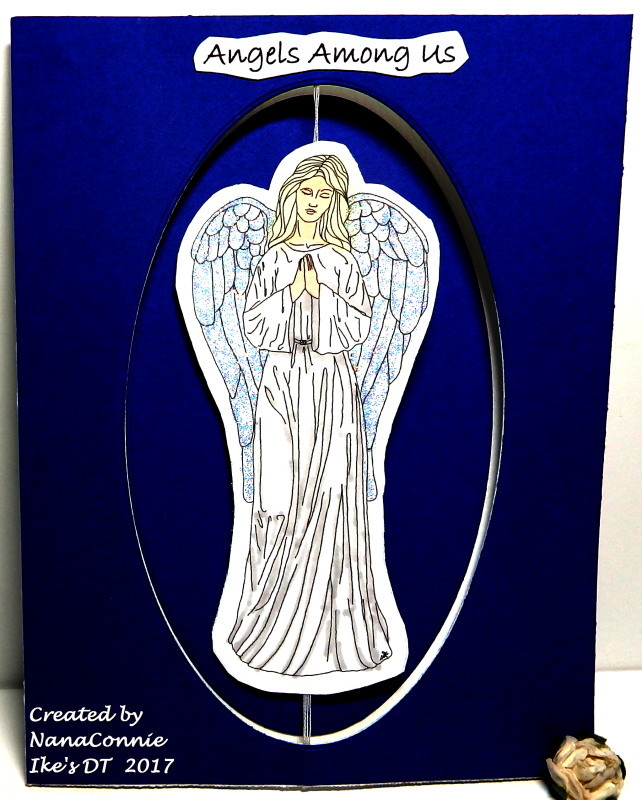 I used the blue oval inside the card to act as a backing for the angel when the card is closed. 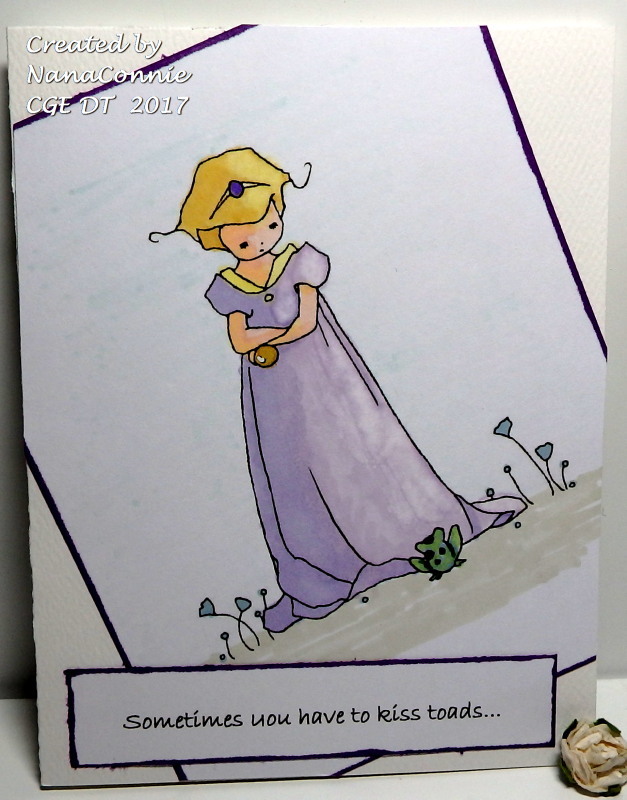 Today's card is another salute to recycling instead of tossing away. 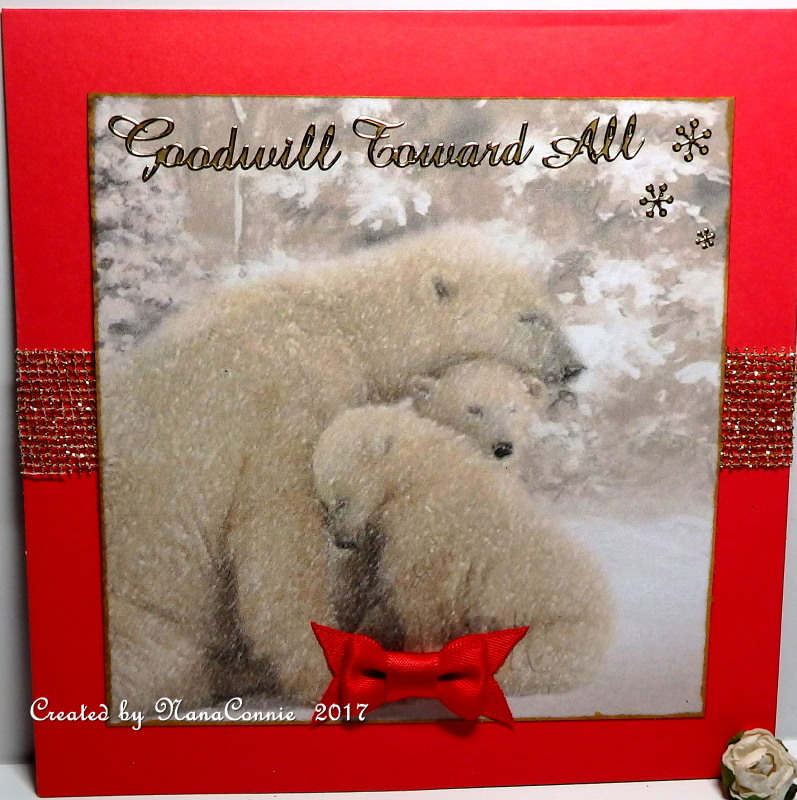 I've been working on the Christmas images my friend mailed to me a month ago and that made me remember a box of old cards which I had saved because I thought some of them could be recycled into other cards. I found a card with this image of the mama polar bear and her two cubs. It was already colored but I wanted a snowier look so I took a white gel pen and added all the snowflakes to the bears and more snow to the trees, then used white chalk and a Q-tip to add another layer of white over the entire thing. The white chalk softened the image and even gave it more depth. Unfortunately, it didn't photograph as well as I had hoped, regardless of how many different shots and angles I tried. This is another of the images sent to me by my friend in Arizona. Early this month, when she read that I had done no Christmas cards at all, she snail-mailed me several Christmas images to inspire me and I started coloring them right away. I've already shared two or three of the cards I've done with those images and will have another one tomorrow or Monday. I thought a blue and brown combo would work well for this sweet snowman bringing a warm winter welcome to the birds. 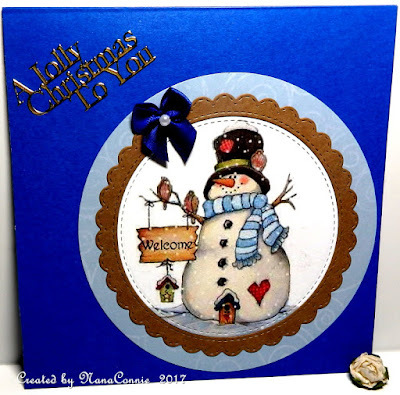 He's been colored with ProMarkers and Copics - with a bit of sparkle on the snow - then I cut the image with a stitched die from Die-namics. I framed that with another stitched die cut, that one scalloped (Memory Box), and a final, plain circle (QuicKutz), cut from digital paper. The bow is one of those I make by the dozens, this time "dyed" with a navy blue marker. No, this isn't a "rubber ducky" kind of post but the "Life is Ducky" title still works. 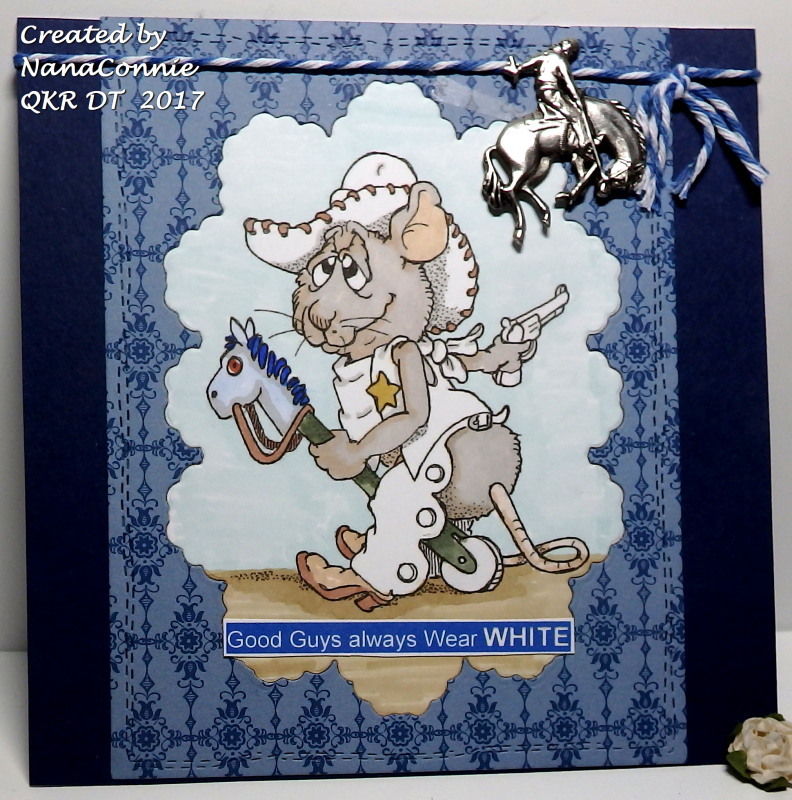 :-D It's Friday again so this post must be for the newest challenge over at QKR Stampede. 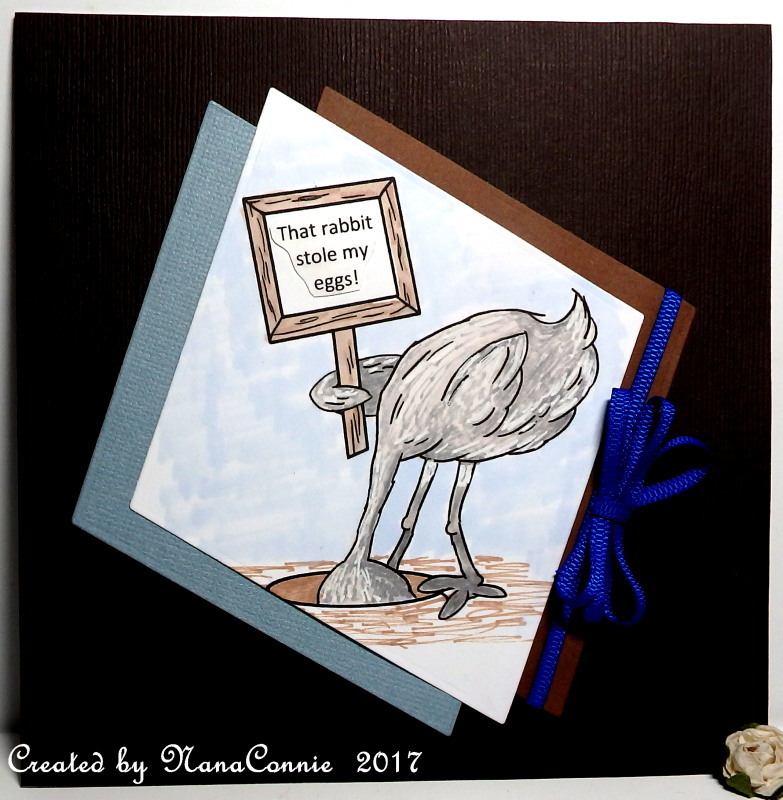 Of course, we have our usual "Anything Goes" theme but our optional twist this week is "Feathered Friends." 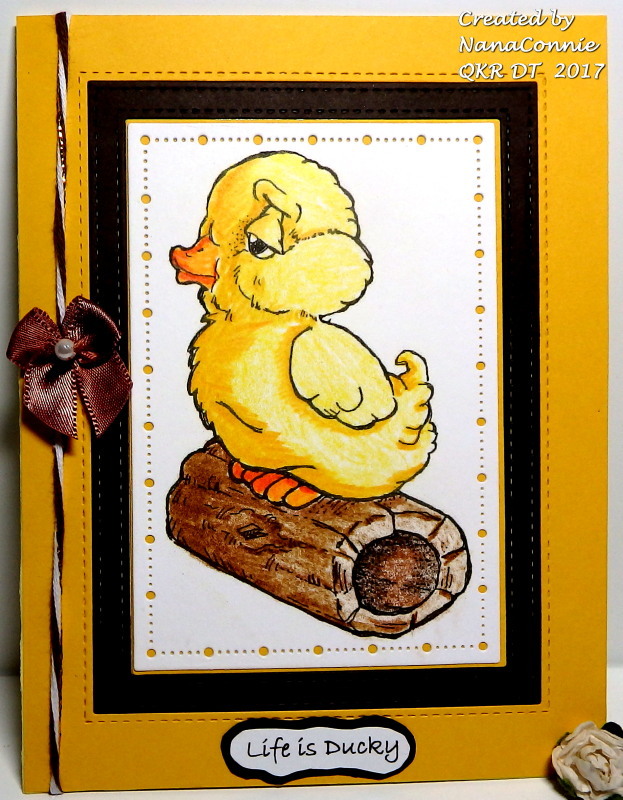 I used this darling little ducky image called "Sitting on a Log." As long as I've served on the QKR DT and as many images as I had purchased before I became part of the DT, somehow I had missed this image until they got the new store up and running a couple of months ago. As soon as I saw the "Feathered Friends" option for this week, I knew I had to use this image. This time I colored with my Lyra pencils and then added some tones and highlights with my ProMarkers. I'm getting to really like how combining polychromos pencils and alcohol markers gives a more intense look than either of those mediums alone. 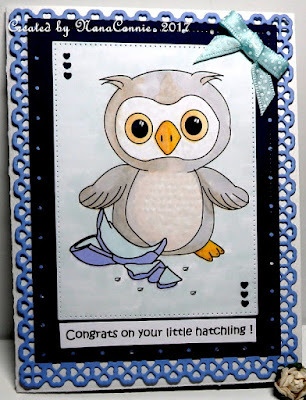 I cut the image with a Gina Marie die and cut both the frame and background pieces with stitched dies from Die-namics. I added twine and one of my tiny, hand-sewn bows for embellishments. The sentiment is stamped, hand cut, matted, and hand cut again. The end result for this card is a CAS, masculine card which is versatile enough for any occasion. I was browsing around several of my favorite monthly challenges, hoping to be struck by something that would inspire me, and I found this at House of Cards. 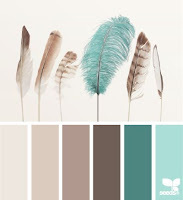 Using both feathers and the colors, here's what I did. I started with the sketch from Sweet Sketch Wednesday. This is a little different from the way I normally color my images. I started with just one feather, colored it with ProMarkers and Lyra polychromos pencils, then I photographed it and used my editing software to add a very light grayscale background. I saved that photo into my hard drive. For the next paragraph to make sense, you need to know that the feather was photographed standing on its 'stem' so that the feather is standing instead of floating horizontally - more like the ones in the inspiration photo. I opened the saved file using MS Word, adjusted the size to what I wanted (see the square, middle feather,) then did a copy and paste two more times to get three feathers. On the two outside feathers, I 'squeezed' the sides in to narrow them from square to a rectangles. I printed that, now having the three feathers in a row as my image and then, after I matted it, I turned it on end so that the feathers seemed to be floating downward. If you're looking at the three feathers, thinking that they are all colored exactly the same way, now you know how I did it. One colored feather, photographed, duplicated and size adjusted to give me three identically colored feathers. 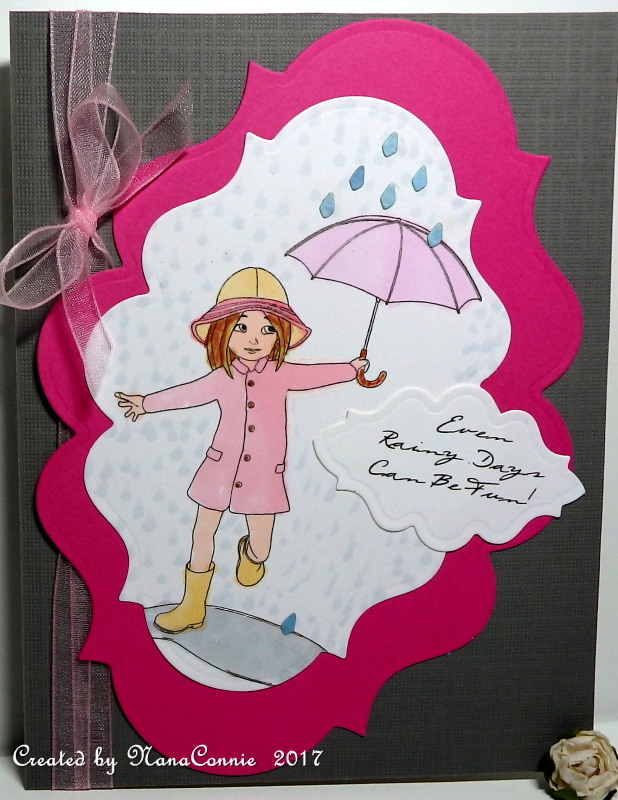 Next step was to choose cardstock in colors from the inspiration photo. Rather than cutting into new sheets of paper, I went through my bin of scraps and found each of the vertical strips. The strip on the far left was cut with a Cheery Lynn die (Scandinavian Boutique) and is one of the pieces from the outside edge of the frame (which was used on another project.) In order to get the darker blue of the color combo, I added a strip of sheer ribbon to the background and also used a snippet of it to 'mat' the sentiment. I added three, tiny, brass, 'pearls' to the top corner and another three to the bottom corner. What is it about sets of three that is so magical in card designing? Three feathers, three strips, three pearls... This is my first work with "mixed media" and I hope to get better at it but mixing photography, fabric, die cuts, and metal with textured papers was the best I could manage this time. I stayed with all simple, geometric, shapes for a clean, somewhat 'industrial' and masculine feel. 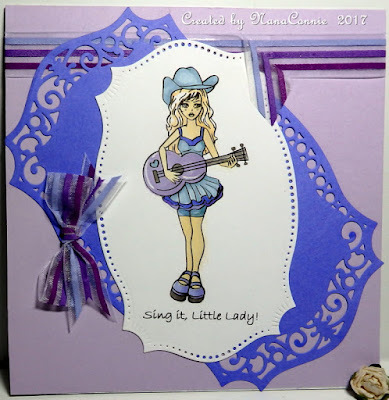 This card reminds me of the Donny and Marie Osmond song "I'm a Little Bit Country" and it really tickled me when Sasayaki Glitter gave this image to us as the freebie for their latest Progressive Challenge. I'm not much into Country music - I was more the other side, Rock and Roll - but my daughter loves it so this card will no doubt go to her for some occasion. 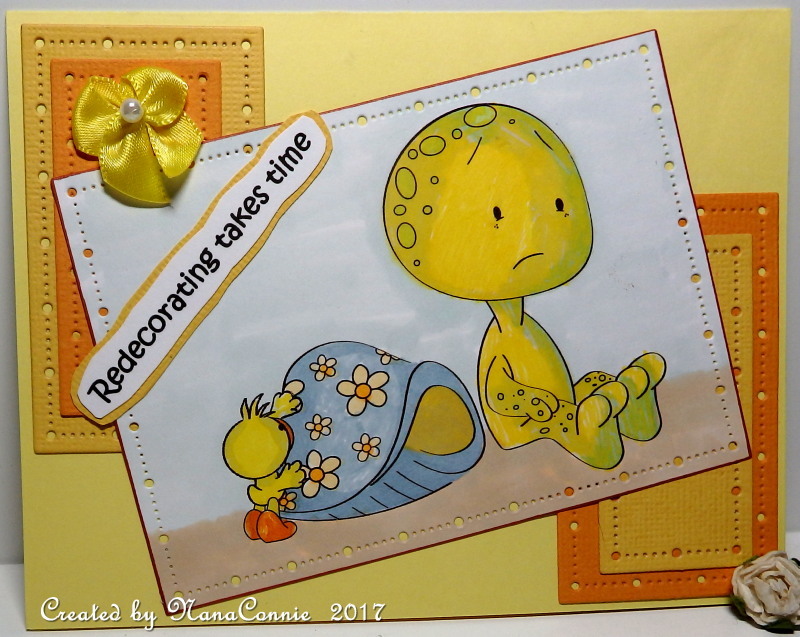 I colored with ProMarkers, then cut it with a pierced die from Spellbinders. The periwinkle die cut (which now looks blue instead of purple) was cut with another die from Spellbinders. I added striped ribbon which came from Really Reasonable Ribbon and it's the last I have of that one. I used the last five inches of it to tie the bow. Here's my day-after-Easter card and you can see that my weird sense of humor hasn't changed. The image is from the Progressive Challenge at Limited Runs on Facebook. 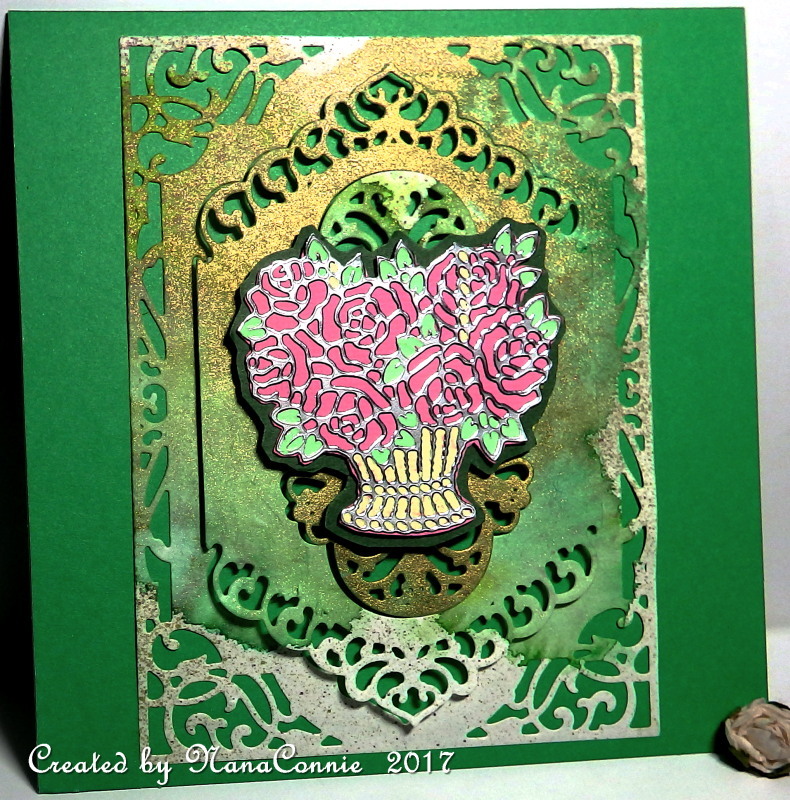 I used ProMarkers and gel ink to color the image, then cut it and the two CS pieces with Diamond dies from Spellbinders. I layered the three diamonds together, then added the blue ribbon before I put them onto the card front. I tied a separate, triple bow and added it. I wanted this to be really CAS and a little bit masculine looking so that's all I did for embellishment. We have a new challenge today at QKR Stampede and our theme is "Anything Goes" but we also have an optional theme of "Flowers" if you want to use it. My card combines image and sentiment from our sister line of digis, Eureka Stamps. 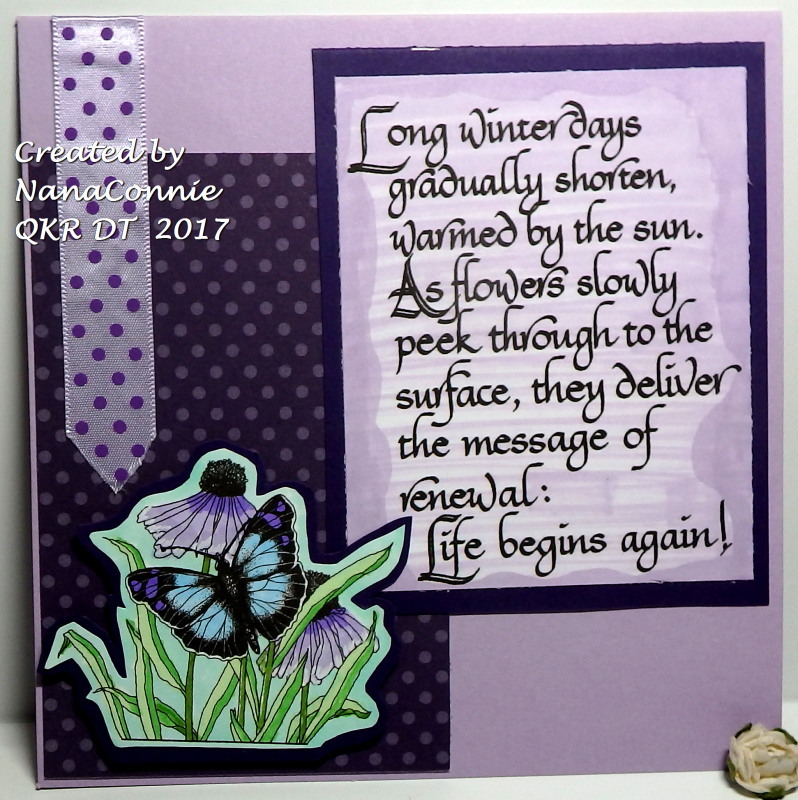 The image is "Butterfly & Sunflower" and the sentiment is "Long Winter Days." Of course, because we're celebrating spring, I had to use my favorite shades of lavender and purple with touches of soft turquoise. The image is colored with my ProMarkers and I also used one of them to shade and highlight the sentiment. I cut the sentiment with a rectangle die from QuicKutz and matted it with another rectangle cut, but I distressed the edges of each one before layering them together. 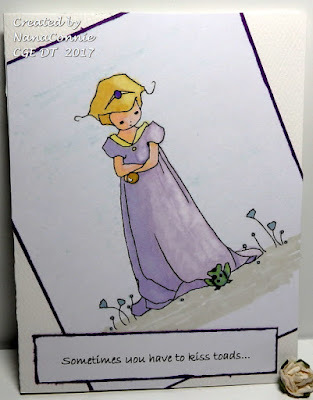 Last week I shared with you a card I made by recycling parts of older cards which had gotten bent or damaged somehow and were ready for the trash can. Before tossing them, I took what I thought could be recycled and set those bits aside for future use. This is another of those projects. The bouquet basket is the part I rescued and recycled. It had originally been stamped and heat embossed with silver EP, then colored with ProMarkers and gel pens. I cut it off the old card, leaving enough deep green CS around it to look like a mat. For the background, I took some watercolor paper, dampened it, and applied green watercolor paint to it. I let the paper absorb some of the watery color, then did a quick dry with a heat gun. I added a spritz of shimmery gold ink and, after that dried, I ironed the paper to get it flat again. 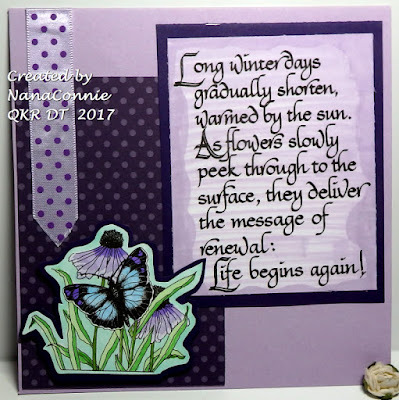 I used one of my die sets (Spellbinders) to cut it into three pieces, then layered those together, adhering the largest one directly onto the card front and putting the two inside pieces on dimensional dots. I deliberately turned the smallest inside piece upside down because I liked breaking up the pattern of the watercolor and sprayed ink. 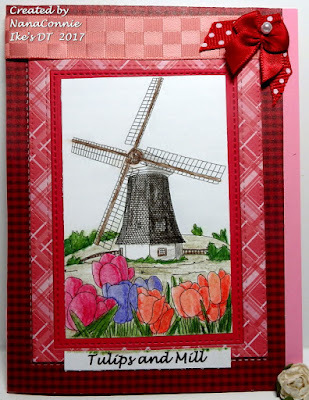 The bouquet basket also went on dimensional dots so there's plenty of depth and texture on the card. I really like the background pieces and plan to play around with more combinations of watercolors and sprayed inks. 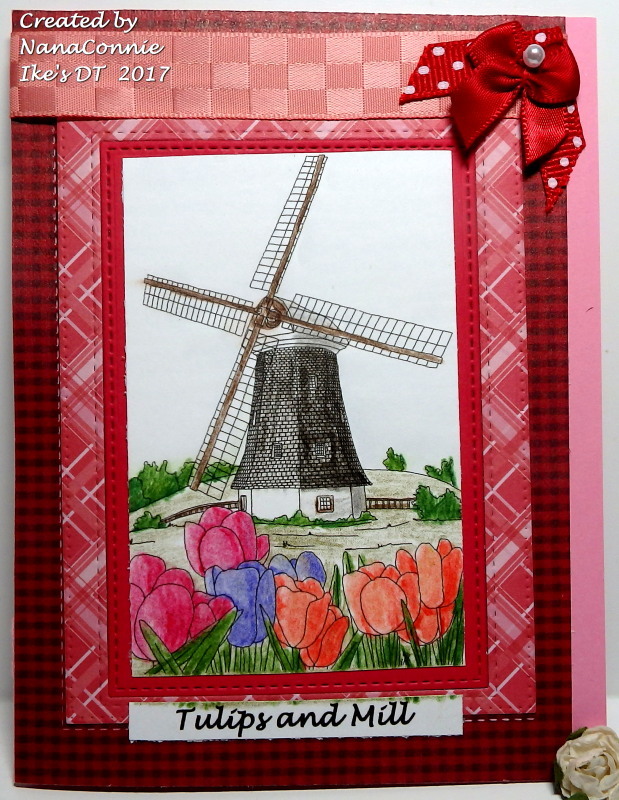 I haven't done a sentiment yet because I'm undecided whether it's a Mother's Day card or a birthday card. I've never taken a selfie in my life and have no idea how to use the camera function "thingy" on my smart phone. My phone is used as a PHONE, nothing else! Yeah, call me old fashioned but it's annoying to have to carry around a cell phone and have everyone in my family, near and far, expect me to answer instantly. Can you believe they actually get panicky if they call and I don't answer? What ever happened to good old "I'm-away-from-home, call-back-later." ??? I colored this Fabrika Fantasy image with my favorite ProMarkers and then cut the image with a plain, square die from Spellbinders. I distressed the edges with one blade of my scissors, then added the sentiment and tied it with navy blue twine. 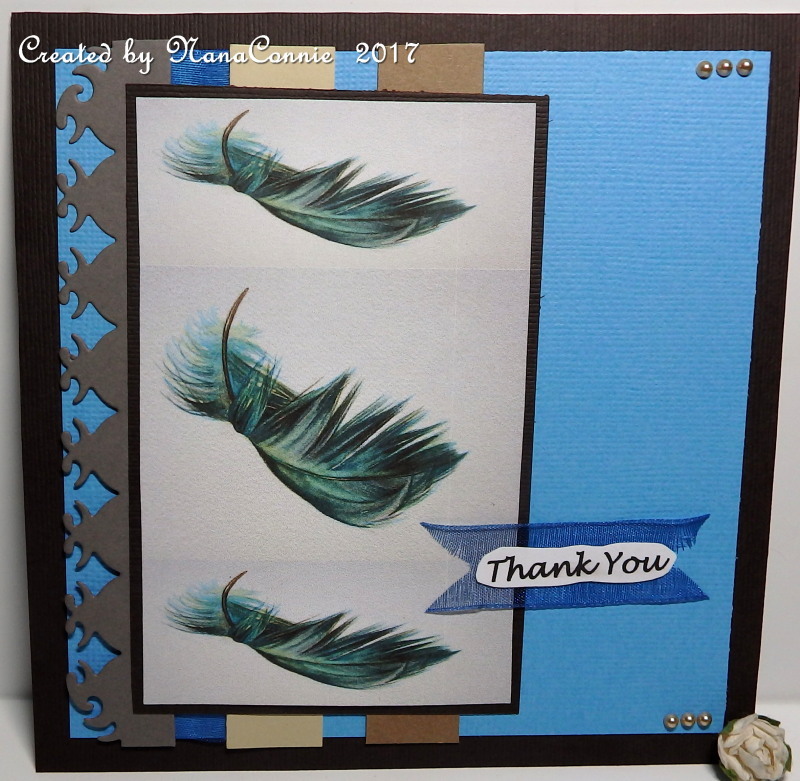 I cut periwinkle CS, also distressed on the edges, and then added everything to the card base. I needed it very CAS since this masculine card is being mailed. 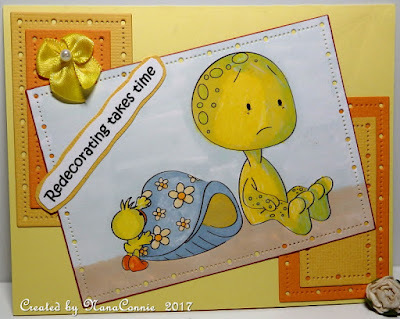 A friend is in the process of re-vamping and re-decorating her craft room so that she'll have more room and better storage options but she's been at it for more than 3 weeks now and feels like it will take forever before it's finished. I understand since 3 weeks without being able to do any kind of creative crafting would drive me crazy, to say nothing of not knowing when it will be done! I mean, it's not like spring cleaning which is normally done in less than a week. Since I have to mail this to her, I thought something CAS (translate "flat") would be the best idea. But I did do several layers. I dug out my ProMarkers to color the image, using lots of yellows because she loves yellow. I cut the image with a die from Gina Marie, then inked the edges. 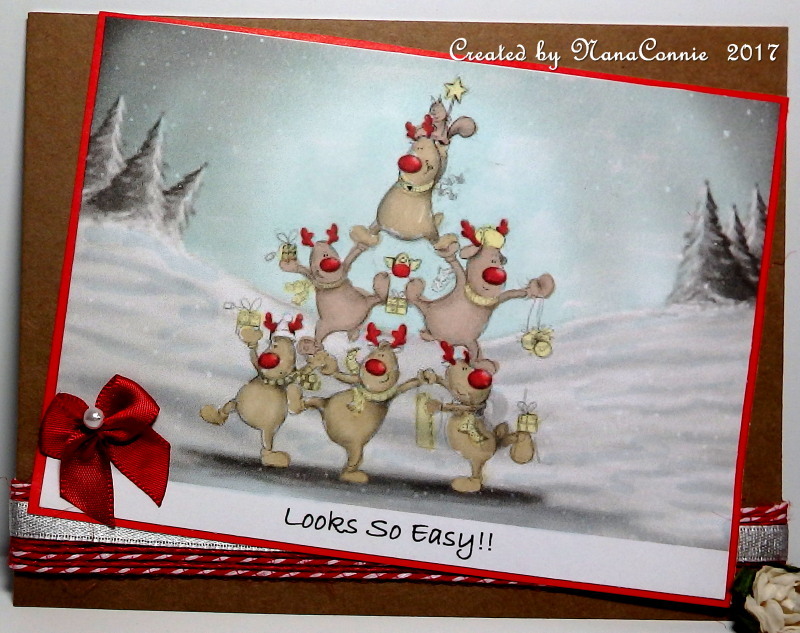 I used two other dies from that same set to cut the stacked rectangles I put in the corners before adding the image. I dug through my stash of little, hand-sewn, bows until I found the one I had already dyed yellow with a marker. I knew I had one and it was pretty easy to find in the middle of all the white bows. Ages ago, I quit making those bows out of various colored ribbons and decided to make them all from white satin ribbon, then dye them whatever color I need. I purchase the same white ribbon every time in batches of 10 yards. It takes a smidge over 4 inches to sew the little bows, and I have to trim off about half an inch total from the tails. I colored with chalks and ProMarkers, then cut the image with a Spellbinders' rectangle die. 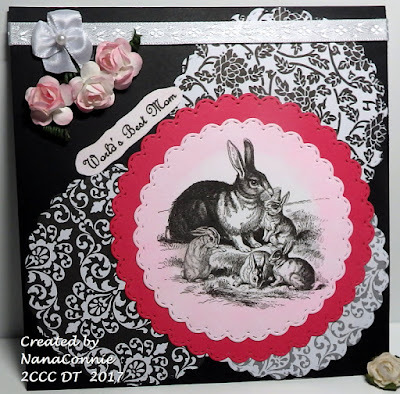 I cut the frame with a die from Bo Bunny, using a scrap of pink paper. I found a scrap of ombre paper i the box of leftover paper bits, matted it with pink CS, and ran it as a vertical strip behind the image. I printed the sentiment with a computer font, hand cut it, and matted it with more pink CS. 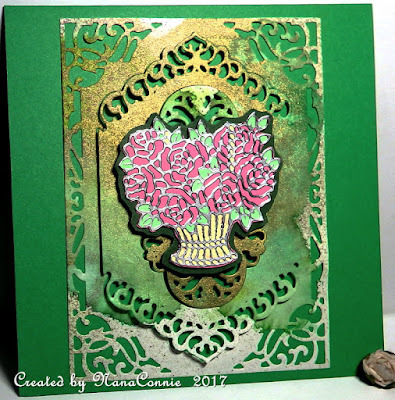 I punched the white flowers for a scrap of mulberry paper, added a touch of glitter to them, and then found the pink flower in my stash. It was already glittery. The final touch was the bowtie bow. 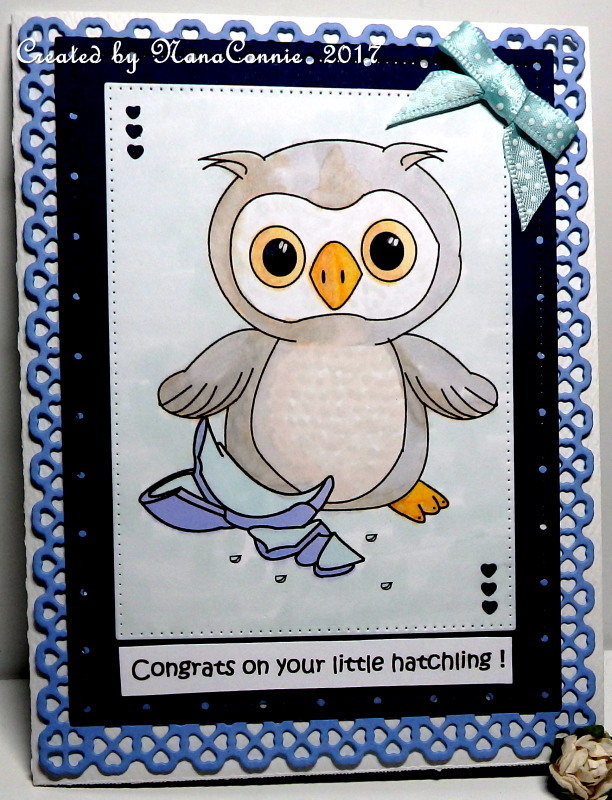 The little owlet is colored with chalks but I did his broken egg shell with ProMarkers. I also used ProMarkers on the background. 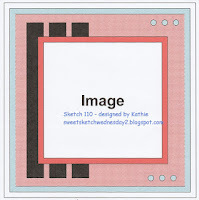 I cut the image with one of my Pinpoint Rectangle dies from Memory Box. I added two frames, one in navy blue and one in sky blue, both cut with Gina Marie dies. 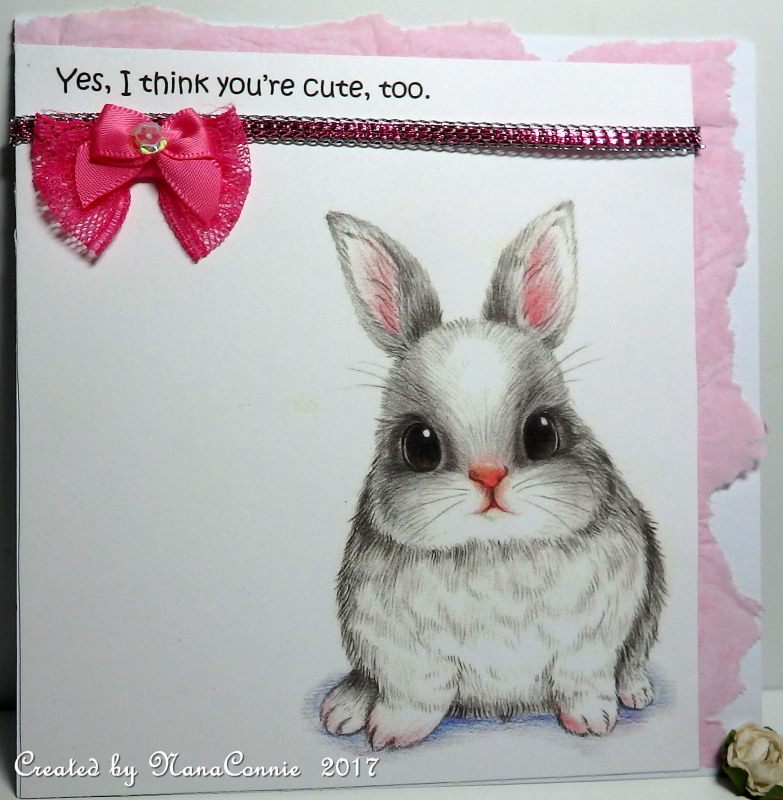 Since this is a masculine card, I kept it really CAS, adding only the tiny blue hearts and a simple, hand-tied, polka dot bow. 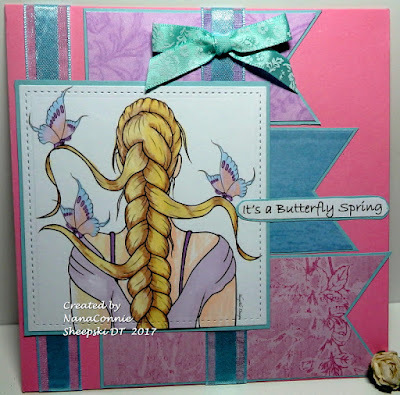 OK, it's time for the latest Progressive Challenge at Outlawz and this lovely image is "Hummingbird n Morning Glory" by Mary Smith, artist at Createful Heart. but I turned it on its side. The image is colored with my Pro-Markers and I added a touch of glitter to the hummer's head and throat. I wish that showed better in the photo. 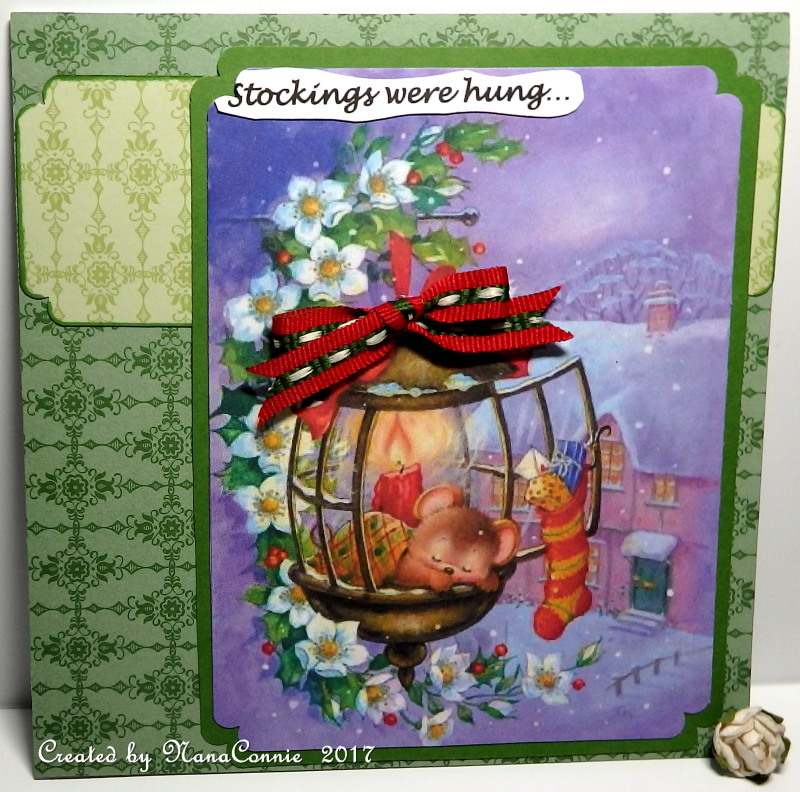 I cut the image with a stitched, scalloped circle die from Memory Box. I framed that with a stitched circle die cut (Die-namics) and then used the same die to cut a 'window' hole in the darker green CS, offsetting it so that the light green CS would frame two sides. I dug out two of my blue ribbons, one for the wrap ribbon and a plaid one for the bow. The flower is cut from fabric ribbon and colored with ProMarkers. Finally, I printed and added the sentiment. Today, I'm having lunch with my daughter and then I'm going to come home and make another dozen 'Thank You' cards for my granddaughter to send to all the folks who have been so generous in helping with the fundraising for her trip to Cheer Nationals in Orlando, FL. She has raised almost one-third of what's needed but only has a little over a month left to raise the other two-thirds. If you think you might be interested in helping out with a few dollars, please see my original post, here. You'll find a link to her fund raising site on that post. She has worked so hard for this honor and deserves to go. 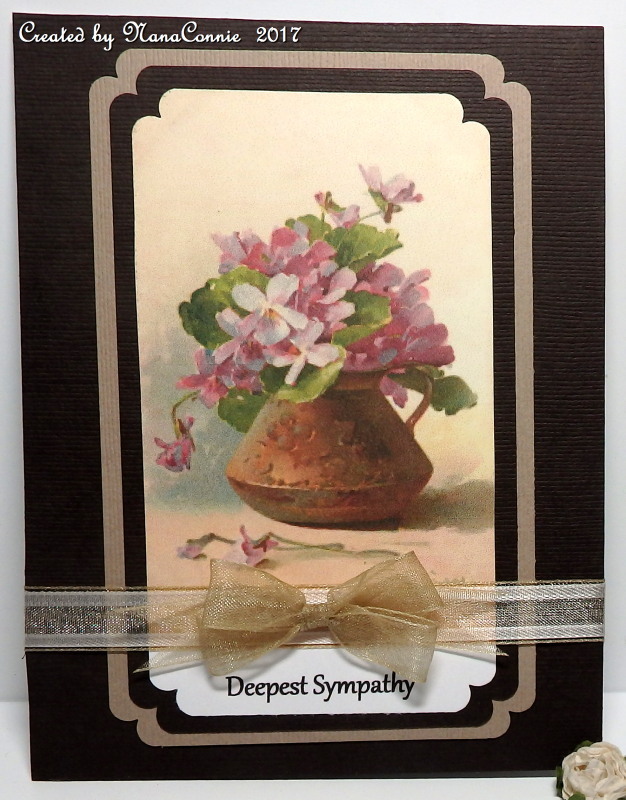 I've actually done a sympathy card before I need one and that's a very rare thing for me. I don't enjoy them and nearly always wait until they're needed, which then makes them even harder to do. But I found a couple of really beautiful, vintage, flower images over on Angela's "Crafting with Jack" blog and saved them right away. Angela is on my DT for the new "2 Crafty Critter Crazies" challenge (see my Saturday post here) and she almost always does one or more Friday Freebies. Be sure to check out her blog. Thanks, Angela! 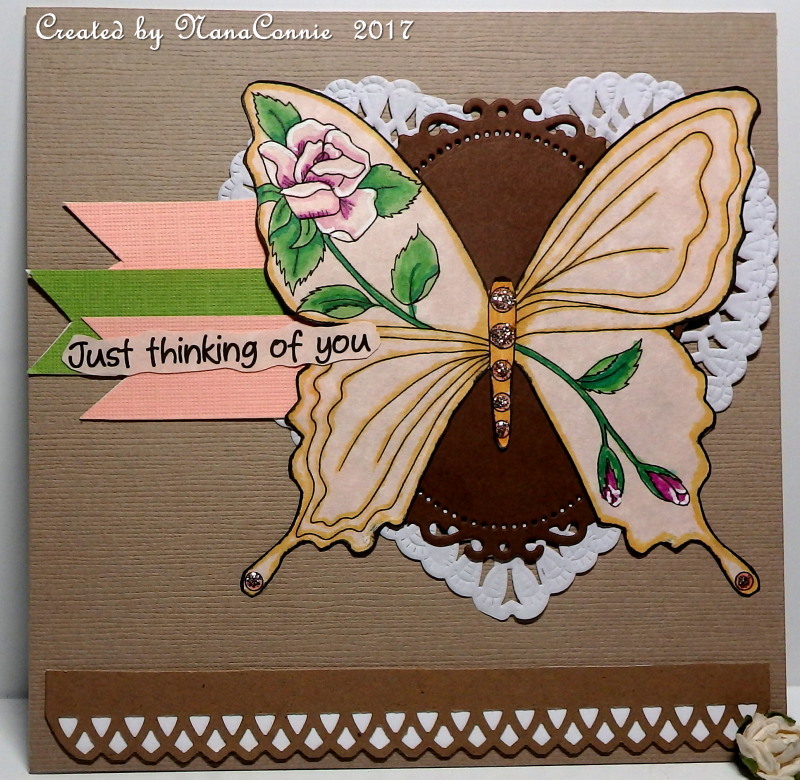 I kept it pretty simple other than using three die cut layers (all from scraps of CS) plus a simple rectangle layered onto a pre-made card base. The image is pre-colored and I simply printed it, adding the sentiment beforehand, then die cut it. I found two scrap pieces of sheer ribbon, layered them together and wrapped them across the rectangle before adhering everything to the card base. The double bow is also sheer ribbon and I tied it using a bow maker. SCROLL DOWN ONE OR CLICK HERE. My card today not only celebrates the newest "Anything Goes" challenge at Crafts Galore Encore, it also features a fabulous image (The Little Frog Princess) from our wonderful sponsor, A Day for Daisies! I knew before I even started coloring that I wanted to do a really CAS card. I colored with watercolors, using clear water to lift some of the color along one side of the princess to create the angle of light and some shadows. 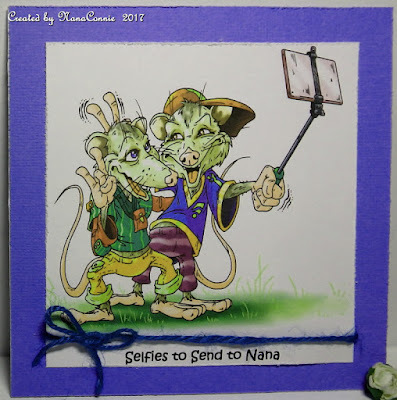 I cut the image into a rectangle, inked the edges, adhered it to the textured card base on an angle, and then trimmed the overhanging corners. I printed the sentiment, cut it into a rectangle, inked the edges, and added it. That was it - no flowers, no ribbons, no bows, no embellishments. Just completely clean and simple. The image is colored with chalks, then die cut with a scalloped, stitched die from Memory Box. I also used that die to cut the black and white dp (DCWV Midnight Chic) circles. The sentiment was computer generated and printed, then hand cut and applied. 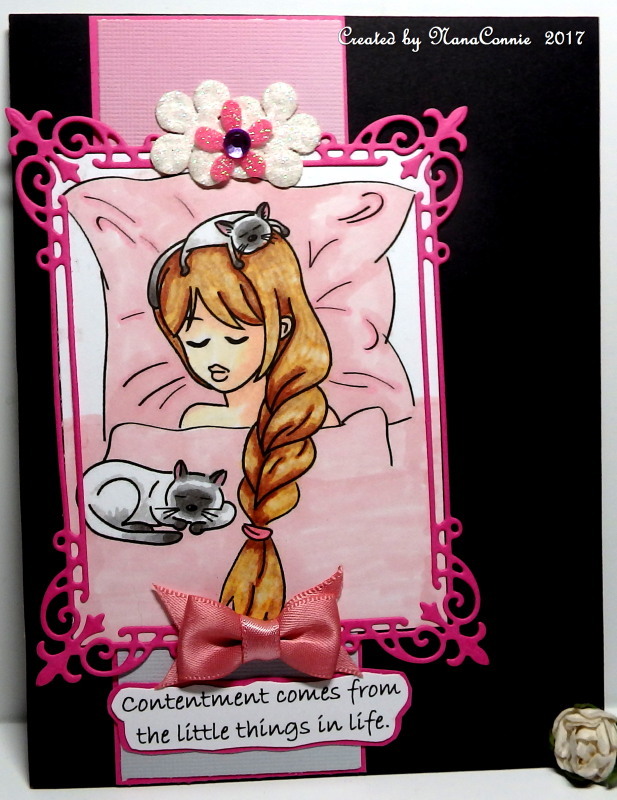 I added the white, embroidered ribbon, the little hand sewn bow and the pink roses and called it done. I hope you're going to come play with us this month. Actually, I hope you'll become a regular visitor to the new blog and play in the challenge each month. You can read all the details of the challenge on the 2 Crafty Critter Crazies blog.